I’ve been dabbling in reading Rumi for the past year or so. 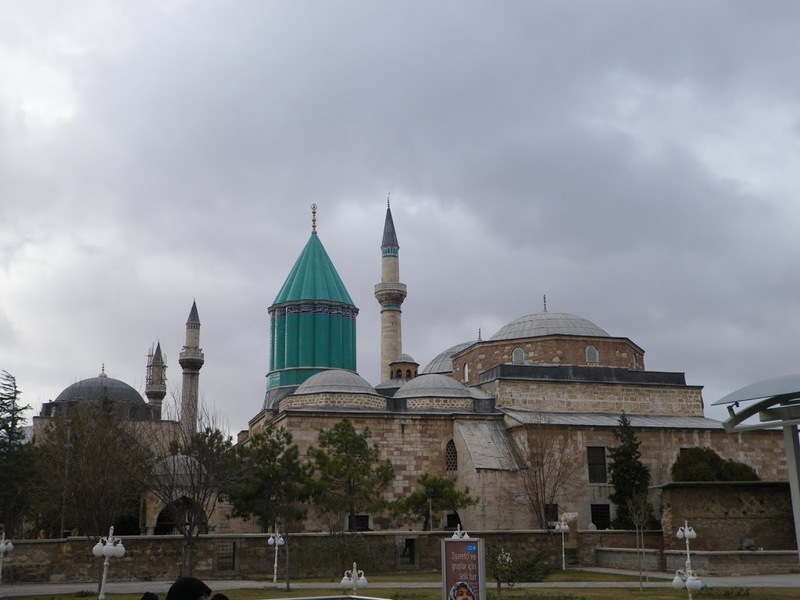 In my time here in Istanbul, I’d like to travel to different parts of the country, so a journey to Konya, where Rumi lived and is buried, made sense. I learned a while ago that every year there is a ten day festival in Konya in December, culminating on the anniversary of Rumi’s “wedding with God,” when he died on December 17, 1273. That sounded as good a time as any to see Konya, so I tried to prepare myself a bit for my trip. 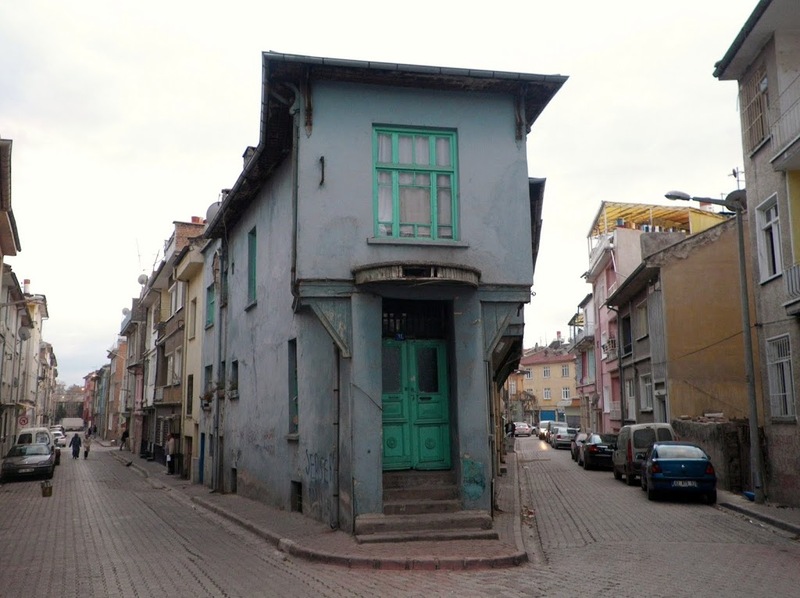 I perused some of the Rumi I brought with me and visited the nearby (and recently reopened) Galata Mevlevi Dervish Lodge Museum. Taking advantage of a Friday when I didn’t have to teach, another teacher and I packed our bags and headed off for a weekend with the Mevlevi Sufis in Central Anatolia. We decided we’d take the night bus on Thursday and a morning bus on Sunday. I don’t really like making plans when I go traveling. I’m more of an aimless wanderer, a nomad, a tumbling tumbleweed, a stray dog. Making reservations in hotels and planning an itinerary takes some of the fun out of travel for me. I like to wander and not think about things too much. I was warned for this trip, however, that because it’s during the Mevlana (Rumi) festival, many people would be flocking to Konya as a pilgrimage and hotels would fully booked. I did an internet search the week before the trip and it looked like, yes, everything online was totally full. I’ve never done couchsurfing, but everyone I hear from says it’s really easy and a great way to meet cool people. I sent out a few requests to be hosted in Konya for the weekend, and heard back from one guy who could put us up. This was a great source of humor in the staff room all week, as our host’s name was “Wanklyn,” who works as a relationship consultant and model. 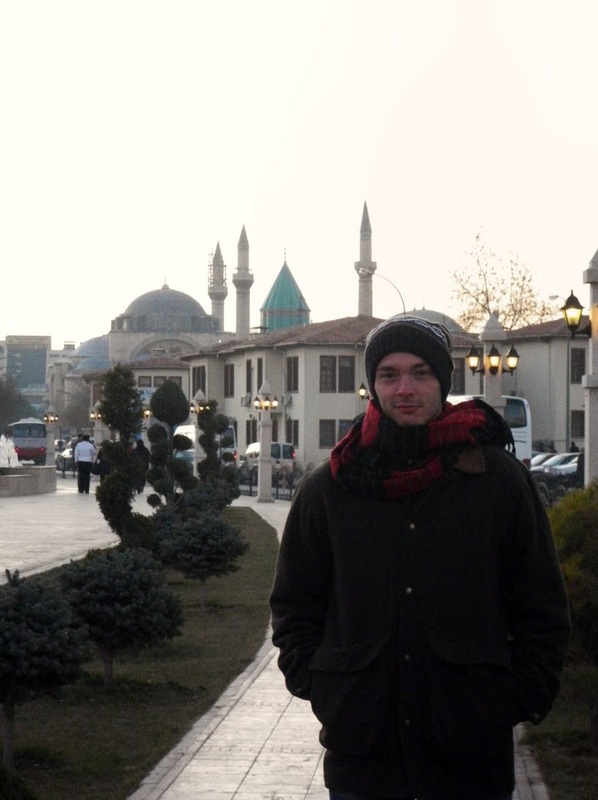 Joking aside, I was very excited about the upcoming journey, especially as our host’s housemate (who owns the flat) was a professor of Mevlevi Sufism at the Mevlana University in Konya. What better company to have for my weekend where I precisely want to learn more about Rumi and Sufism? We set out from the Istanbul Otogar at midnight on Thursday. 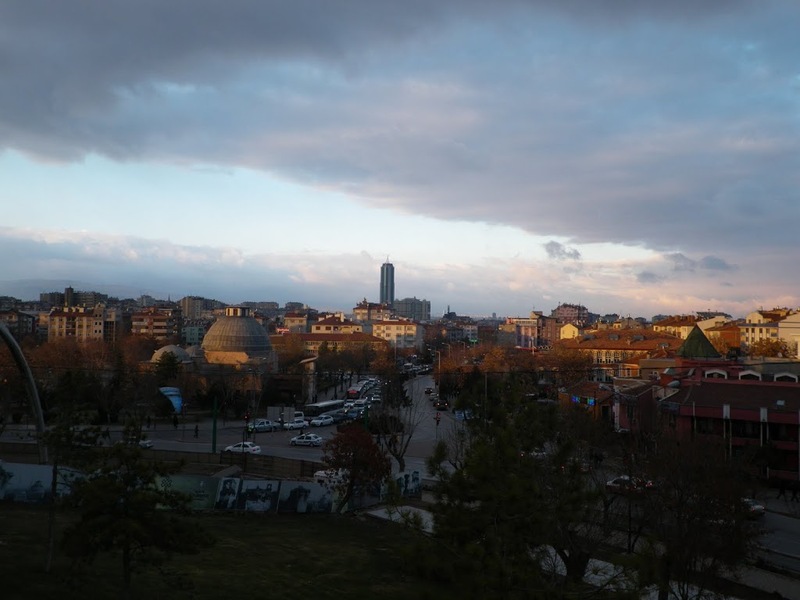 The ten and a half hour bus ride was not a pleasant affair, but we were excited to arrive in cold, blustery Konya. I’d estimate that it averaged about 0 degrees during the day and -2 at night, or high 20s, low 30s for our trip. Konya’s in Central Anatolia, so it’s quite windy as well. Discussions as we wandered around the city were as diverse as whether it was cold as balls, or whether we had gotten to the point of it being colder than balls. We weren’t sure if we’d see Mr. Wanklyn (whose name always brought a chuckle) at the bus station or not, as he had lessons to teach and some other things to do during the day. We found an internet cafe upon arrival and sent him a message, though, alerting him of our arrival and giving him my phone number so he could contact me. 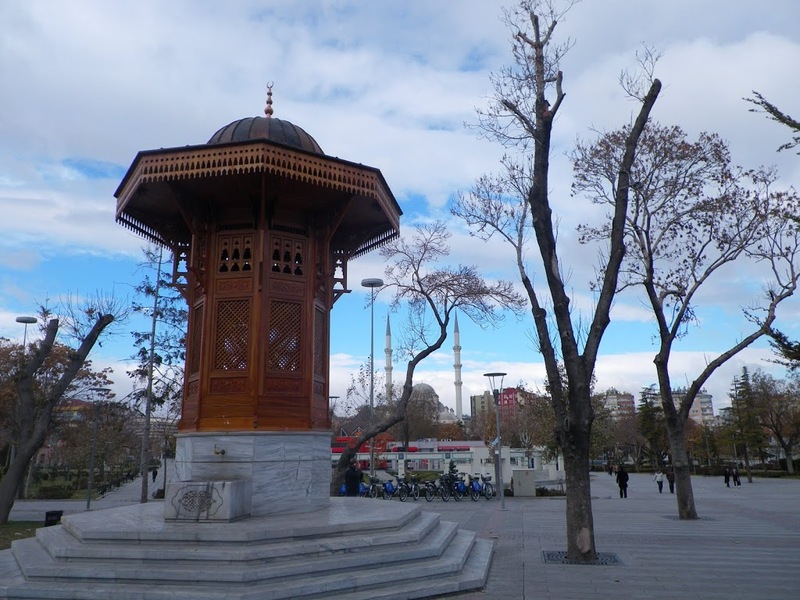 We then set about wandering around Konya, discussing the cold. Events of the afternoon included the Mevlana mausoleum, where Rumi is buried. Unfortunately, it was very crowded and was difficult to appreciate everything inside. I was glad to have seen it though. We also stopped in to the 12th – 13th century Alaeddin Mosque, which sits on the Alaeddin hill right in the city center. Sadly, though, our lunch place did not offer Turkish coffee so I could not rid myself of my coffee deprived headache I’d been battling all day. 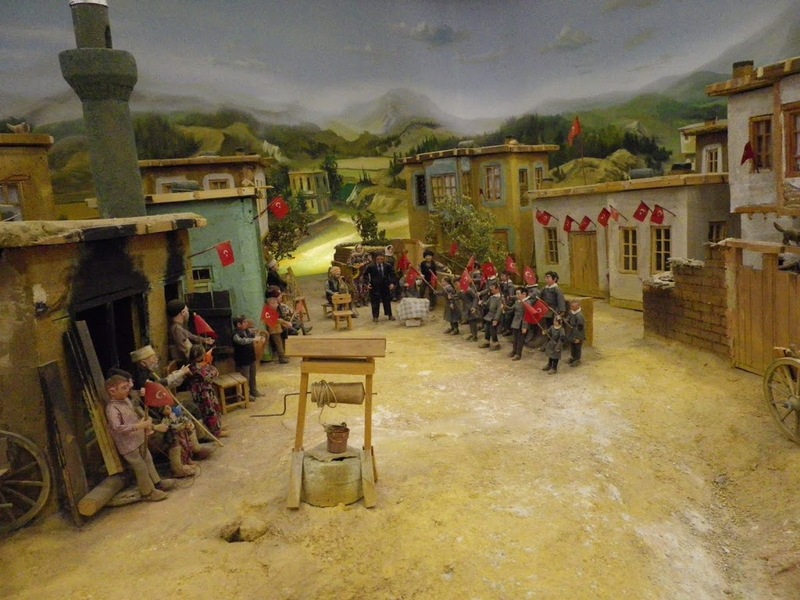 We also found a great museum that was a reconstruction of various wars. It was very funny. We weren’t exactly sure where to get off the bus, but after about 25 minutes and seeing an old guy get off the bus (whom we knew was going to the Bosna Hersek district), we decided we’d pick a spot and get off too. I knew it was near the Emniyet, or police station. 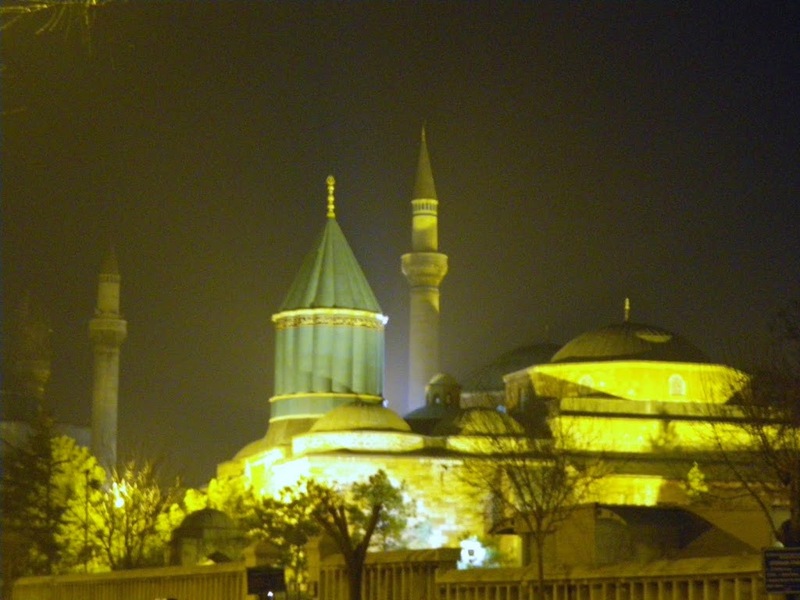 So we started asking directions to Ilyas Sokak, and headed off into the cold, dark night in the Bosnian suburb of Konya. We walked for about another half hour before we found the police station, and they directed us to the block of flats we figured must be where we’d find our Wanklyn. We were unsure what couchsurfing etiquette was: should we bring a bottle of wine? Offer to cook a meal? We decided that first we would get inside and get some feeling back in our fingers and faces, and find a store to buy a bottle of wine later. We found the lift and rang the bell of what we hoped was his door, hoping that he would be home so we could warm our chilled bones. We heard someone shuffle to the door and hesitate, peering through the keyhole before warily opening the door. It was an old Turkish man in slippers. Buyurun (can I help you?) We then had a conversation using his broken English and our broken Turkish. Thankfully my travel companion has been here for a year longer than I, so his broken Turkish is more advanced than mine is. We explained that we were looking for a certain Wanklyn, who had invited us to stay with him through couchsurfing. He said that yes, our Wanklyn does live there (so this must be the professor of Mevlevi Sufism, I thought to myself), but he was working in the city center at the moment and would be back later. He then explained that while our Wanklyn had invited us to stay through couchsurfing, he was the owner of the flat. He did not invite us to stay with him, and he did not want us or any other couchsurfers to stay with him. We said that we understood. He closed the door, and we went back into the cold night. As upset as I was about having to return to the air which was now much colder than balls, having to find our way back into the center and find some place for lodging, I could not help but laugh about our current situation. What a fantastic example of irony! Two frozen, hungry travelers showed up on the doorstep of a professor of Mevlevi Sufism, who promptly turned us away into the night. Mevlevi dervishes had been known to be wanderers, relying on the goodwill of others for sustenance. It wasn’t hard to understand why he’d turned away two strangers who showed up on his door, but an expert in Mevlevi Sufism would be someone I thought would be open to the idea of inviting us in. Just because he teaches it doesn’t mean he believes in any of it, you know, my friend mused as we shivered our way back to the bus. Yeah, he probably thinks Rumi was a hippie and prefers to read Ayn Rand instead, I responded. By the time we got back to the center, two hours had gone by since we had left the center in search for our lodging for the night. There had still been no word from Wanklyn, and there wouldn’t be any word for the duration of the weekend. Thankfully, we didn’t have to search too hard to find a hotel to stay in. Not the greatest place, but it was fairly priced and centrally located. We warmed ourselves up and headed out to meet up with a friend of mine who also teaches in Istanbul, whom I know from teaching in Georgia. He came to Konya for a day as well. We went to dinner and tried Konya’s kebab, the firin kebab. I thought that after the misery of the evening and Wanklyn’s disappointment, it would be nice to sit and have a beer somewhere. Two of us went out on a quest for a pub in Konya. We wandered for a good long time. And had a spectacular misadventure along the way. Konya is a very conservative place, so it was tough to find a place that served beer. But finally I saw a place with Tuborg beer in the window. Finally, a watering hole, the Rock Club! It was an odd place, I reflected, as we went through the first doors and I got patted down by a security guard. We then went through the second doors into the pub. This certainly is odd, I thought, as I noticed that the bar was mainly empty, except for a guy with a guitar on stage, one guy shaking in a corner and a handful of haggard looking women flocking around the place. It was a big place, tough to see anything through the cigarette smoke, almost completely empty, and the wait staff were all wearing suits with bow ties, and shook my hand as I went in. Including the guy shaking, I don’t think there were any paying customers. I’ve drunk in stranger bars than this, I thought, remember the cowboy bar on my street in Prague with the Christmas decorations and the guy who yelled at us for reading books! I think it was called the Country Club. Then there was the Branik bar with beer for 15 crowns (yikes), where I pretended to be on a date with my friend so neither of us would get assaulted, or the other Branik bar where the guy with the mustache would bring you your next beer when you were halfway done with your first – it was difficult to pay your tab there. Or the bar in Brno where I thought I was going to get beaten by three surly Czechs. I have a knack for finding strange, unpleasant places filled with characters from a Dostoevsky novel. This place sure was mightily unpleasant, but a few beers and a few laughs tend to make miserable travel adventures less stressful. Hey, uh, Sven, this place is a brothel, do you want to stay? No. Let’s go. Ah, clarity! It all makes so much more sense now, I thought, as I bolted for the door. Good thing my companion was more astute than I was so we didn’t get scammed into a really expensive tab or run into a nasty situation! We realized that there we wouldn’t find beer in Konya, so we drank a tea in a normal cafe on the main street and laughed about Georgia. Disappointed that I didn’t find a beer, but thankful that I didn’t get into trouble in Konya’s den of iniquity, I headed back to the hotel. The next day we did some more sightseeing around the city. We stopped in to a few of the museums that we hadn’t been able to go to the day before (sadly, the old manuscripts museum was under construction.) We visited the tile museum as well as the mausoleum for Rumi’s spiritual mentor, Shams of Tabriz. Both were packed to the gills with people seeing the holy sites on their pilgrimage to Konya. I was glad that we’d opted to see Rumi’s tomb the day before. We then headed to the cultural center to see a ceremony of whirling dervishes. 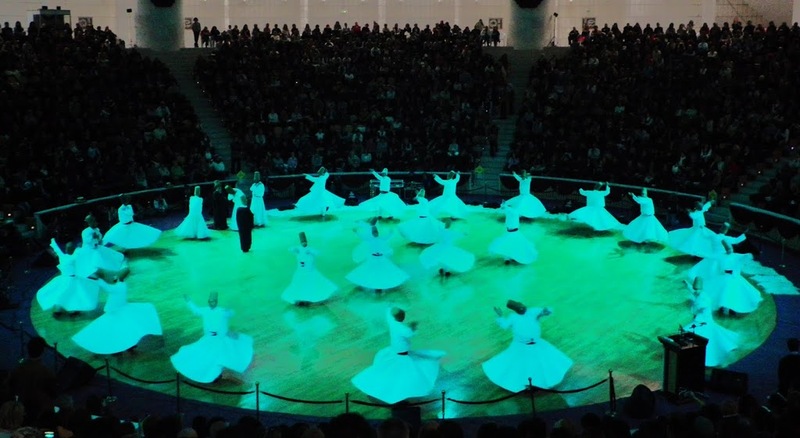 As Konya was the center of the Mevlevi Sufis, this was basically the “Olympics of whirling dervishry,” my friend remarked. Prior to the whirling of the dervishes, though, there was one guy who sang Turkish songs (ala Tom Jones) for about 45 minutes, followed by an old man who gave a mumbling speech in Turkish for another twenty minutes or so. 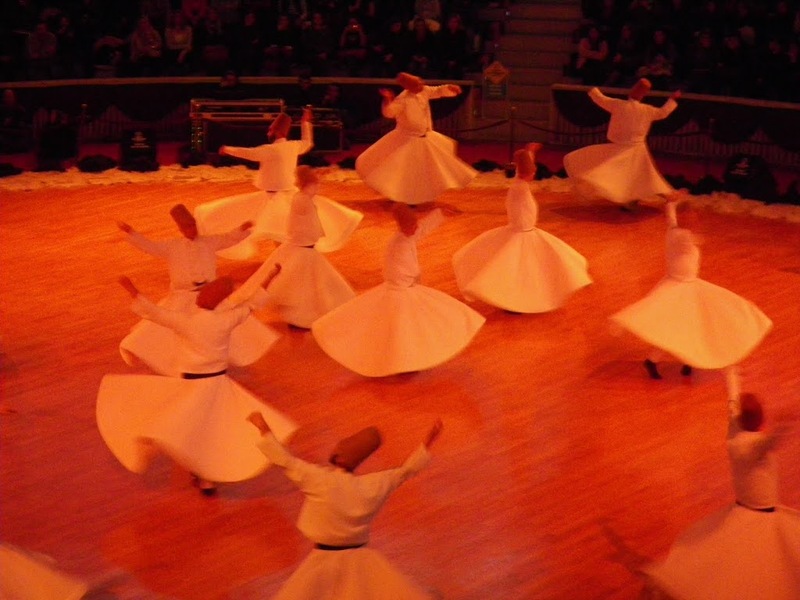 Then the dervishes went on, which was quite cool to see. After a quiet evening (Konya more or less shuts down around 8), it was back to the bus station, and another 10 hours back to Istanbul, where we were happy to realize that it was considerably warmer, and I was sad to realize that I still have no internet in my flat.